CHICAGO–As mannequins go, preemie Hal is on the top of his game. He is smaller than a full-sized infant, just like the one in 10 babies born prematurely each year in the United States. Hal has soft, supple skin and his mouth opens wide to accommodate the breathing tube, since pediatricians need to practice and practice again until they are able to execute intubation confidently on a squirming newborn. Because he's not real, that's where Hal and mannequins like him fall short, Children's National Health System researchers explained during the 2017 American Academy of Pediatrics (AAP) national conference. Hal's tongue does not move naturally, nor does his head. There's no fluid lubricating his mouth and throat. When you gently tilt his head back to insert the plastic endotracheal tube, Hal's neck does not flex as realistically as it ought. "Current mannequins lack physical and functional fidelity and those shortcomings take a toll on competency as pediatric residents transition from practice simulation sessions to the actual clinic," says Children's National Neonatologist Lamia Soghier, M.D., lead author of the poster presented during AAP. 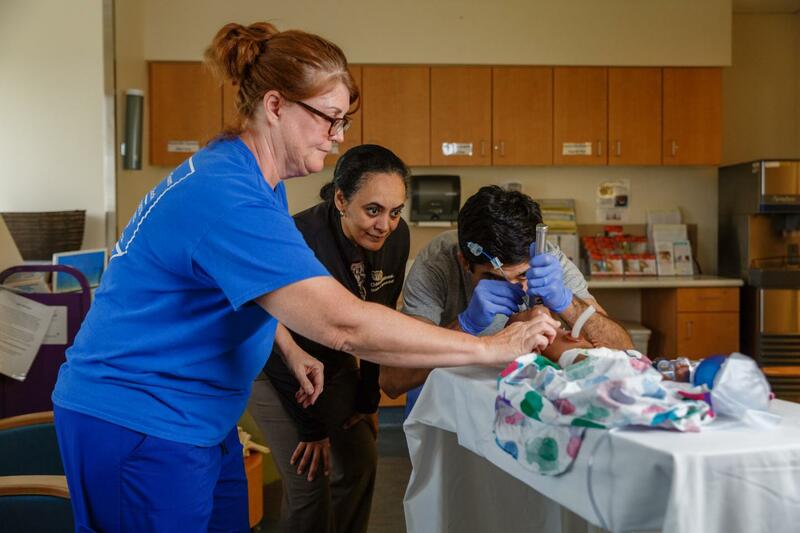 "Our work tried to tease out the most important differences between simulating neonatal intubation and actual clinical practice in order to ensure the next generation of mannequins and practice sessions translate to improved clinical competency." The study team conducted in-depth interviews with 32 members of the clinical staff, including attending neonatologists and second- and third-year fellows, asking about critical differences in environment, equipment and context as they participated in practice intubations as well as actual intubations in the clinic. Mannequins' vocal cords are marked clearly in white, a give-away for trainees tasked with correctly identifying the anatomical feature. In addition, the mannequins are so stiff they need more force when practicing how to position them properly. In the NICU, using that much force could result in trauma. Because current equipment does not simulate color change with a Pedi-Cap–a non-toxic chemical that changes color in response to exhaled carbon dioxide–trainees can develop poor habits. Training scenarios need to be designed with the learner in mind offering an opportunity to master tasks in a step-by-step fashion, to practice appropriate sedation techniques and for beginners to learn first before being timed. There is a marked mismatch between the feel of a simulated training and the electric urgency of performing the same procedure in the clinic, eroding trainees' ability to adjust to wildcards in the clinic in real time. "We carefully design our sessions to provide trainees with the suite of skills they will need to perform well in clinic. Still, there is more we can do inside the hospital and in designing the next generation of mannequins to lead to optimal clinical outcomes," Dr. Soghier adds. "As a whole, mannequins need to more closely resemble an actual newborn, with flexible vocal cord design in natural colors. The mannequin's neck should flex with more degrees of freedom. The model's skin and joints also need to be more flexible, and its head and neck need to move more naturally." Lamia Soghier M.D. ; Karen R. Fratantoni, M.D., M.P.H. ; Ellen Goldman Ed.D.